Premier Garage Powered by Tailored Living can help you design and organize your garage for all your lawn and garden tools by installing a combination of customizable garage organization systems. Setting up a plan of how you want your garage organizers arranged is the first thing that needs to happen before you can start enjoying your new storage system. Then, by utilizing the flexibility of adjustable gridwall and slatwallracks, baskets, hooks, and wall panels, your lawn care items will be accessible and safely stored away as well. Lawn and garden tools require proper care in order to keep them in top condition. 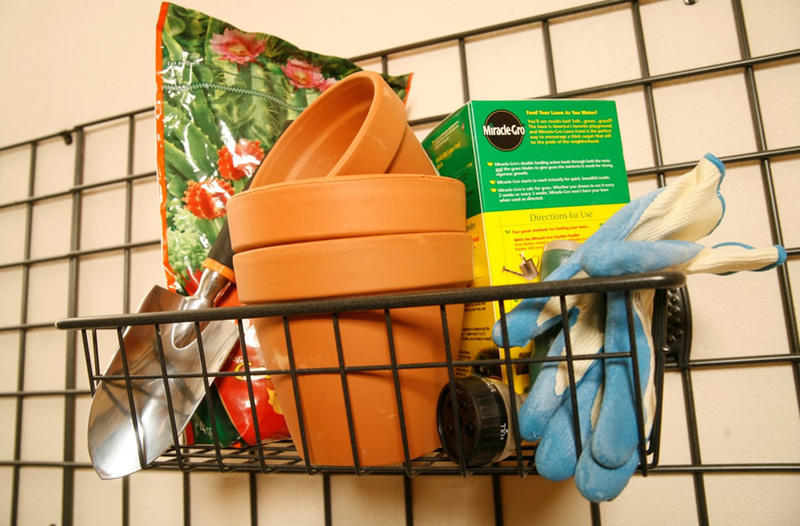 Garden tool storage - a place to store everything safely and efficiently - is an essential piece of keeping your lawn and garden tools clean and your garage organized. Garage organizers allow you to keep your tools, big and small, in a single location that's easy to access when it's time to edge the lawn, prune the shrubs or work in the garden. Garage organization solutions such as wall and base cabinets, as well locker-style cabinets with adjustable shelves keep hazardous items safe. When storing any insecticide, weed killer or other toxic chemical, always lock the storage unit to prevent children from accessing anything that can be ingested and cause harm. In addition to storage for your various lawn and garden tools, adjustable hooks and wall grids work great for small hand tools such as garden forks, trowels, pruners, spray bottles, cordless drill/driver and other portable power tools. Rakes, spades and other long-handled lawn and garden tools are best kept off the garage floor and stored neatly on a wall organizer. Keeping these tools handy can cut down the time you spend maintaining and repairing fencing, decking and more. Our organization specialists look forward to helping you design and install the most efficient space possible. Spring and summer are just around the corner! Simply call or contact us today to schedule your complimentary in-home consultation today and take advantage of our current sale!